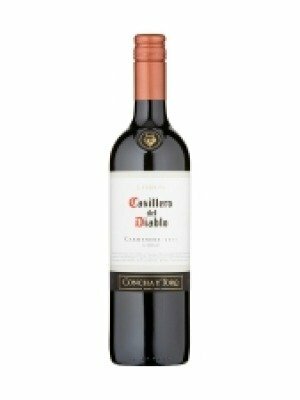 Casillero Del Diablo Carmenere is a popular Chilean Red Wine available from DrinkSupermarket.com in 75cl to buy online. Visit DrinkSupermarket.com for the best price for 75cl of Casillero Del Diablo Carmenere or compare prices on our other Chilean Red Wine products. Casillero del Diablo Reserva Carmenere is a strong, dark purple wine with fragrance of dark plum, chocolate and traces of coffee and toasty oak. On the taste buds, there are notes of dark plums and spice, generously framed by toasty American oak with a glossy and well-structured mouth-filling texture. Where to buy Casillero Del Diablo Carmenere ? Casillero Del Diablo Carmenere Supermarkets & Stockists. You can buy Casillero Del Diablo Carmenere online in most retailers and find it in the Chilean Red Wine aisle in supermarkets but we found the best deals online for Casillero Del Diablo Carmenere in DrinkSupermarket.com, Amazon.co.uk, Tesco Wine, and others. Compare the current price of Casillero Del Diablo Carmenere in 75cl size in the table of offers below. Simply click on the button to order Casillero Del Diablo Carmenere online now.